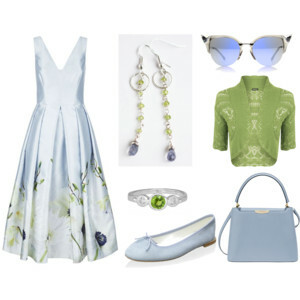 I love to toy with the website Polyvore from time to time. It’s a fun repository of fashion, home items, and accessories, and I could spend hours just flipping through to see what’s there. Each of us created a new piece of peridot jewellery for the August newsletter, so I thought I would have fun with them and create some matching outfits! 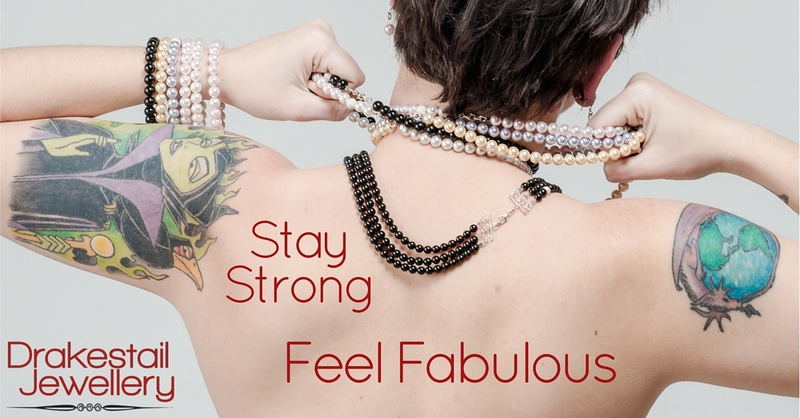 If you know us at all, you know we have a serious love affair with pearls. This first set is built around a two-strand necklace with tiny peridots and butter yellow pearls. Wanting a classic look, I went with an a-line polka dot dress that would make the peridot pop, and then accessorized in the sunny butter yellow that matched the pearls. Top it off with a fun fascinator and some cat’s eye sunglasses, and you have a perfect look for an afternoon out or a fun date! The second set is built around a funky necklace with three short twists of peridot set into a silver chain. One of the first pieces I found was the skirt, and I loved the geometric pattern at the bottom. I thought it matched perfectly. From there, the rest just fell into place, and I ended up with a spectacular outfit that would be great by day with a jacket, and great for cocktails without.I’m always a big fan of versatility, and this definitely fits the bill. The third set is built around a pair of long drop earrings with tiny faceted peridots and a pair of tiny faceted iolite briolettes.I went a different route with this set, after finding the dress, which includes both greens, to match the peridots, and blues, to go with the iolite briolettes. I thought I would accessorize with the pale indigo blue of the iolites, and bring out the green with a little green shrug. This ultra-feminine outfit would be perfect for a brunch, tea, or some warm-weather window shopping. Which collection is your favourite? How would you wear our jewellery? We’d love to get your opinion! « Put on your dancing shoes this fabulous Friday!